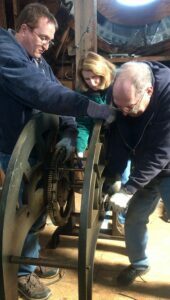 The clock, originally installed in the early 1900s, is being restored by Balzer Family Clock Works of Freeport. The clock atop Biddeford City Hall is being restored, four years after it stopped working and more than 100 years after it was originally installed. Employees of Balzer Family Clock Works removed the E. Howard & Co. clock from the city hall clock tower last Friday and brought it to a Freeport workshop for repairs. The restoration work will include replacing original mechanical components and installing an automatic winding system so city staff will not have to manually wind the clock. Some mechanical components were removed in the 1960s and electric motors were installed to drive the remaining mechanical components for the time function and to ring the bell, according to city officials. The work is being paid for using a $150,000 grant from the American Express Partners in Preservation Program that was awarded through a national online voting contest. The timepiece will be returned to the clock tower in October. The company will then restore the four dials of the clock and the clock hands. The clock tower structure has been stabilized and the repaired clock will not be at risk of falling once it is reinstalled at City Hall. The City Council voted in January to hire Balzer Family Clock Works to restore the clock. No city funding is being used on the project. In addition to the clock not telling time, the condition of the entire clock tower has been a concern of city officials for years. But city leaders have so far been unable to sell residents on the need to repair it and fund other upgrades to the building. Biddeford City Hall, listed on the National Historic Register, was designed by noted Portland architect John Calvin Stevens. The granite and brick city hall was built in 1894 to replace one destroyed by fire. In 2014, Maine Preservation added the building’s clock tower to its annual list of the state’s most endangered properties.